We talk a lot about links in the SEO industry. Here we’re going to talk about the absence of links. How a mention without a link is good for SEO. What is linkless attribution? Linkless attribution is the mention of your business or brand without a hyperlink. An instance of linkless attribution is sometimes called a linkless mention. If you care about the ROI of your website, you know the importance of mobile page speed. Users expect pages to load in the blink of an eye or else they bounce. Unfortunately today, websites can take a handful of seconds to load, meaning grumpy users. Google has pushed its major speed initiative, Accelerated Mobile Pages — AMP for short — hard over the last year. We know that mobile-friendly pages get an organic ranking boost in Google. Currently, AMP results are delivered as a cluster in a carousel at the top of a search results page. Later this year, within Google’s mobile search results AMP pages will be indicated with a small grey circle with a white lightning bolt. In advance of AMP expanding in Google Search, over the next few weeks Google is posting pointers to help businesses "AMPlify" their websites. Follow or post with the #AMPlify hashtag on Google+ and Twitter for the tips and conversations. As AMP features and specifications evolve, marketers can capitalize on improved UX and ranking opportunities by staying up to date on AMP. After some ranking shifts on Sept. 2, people were wondering, is this Penguin? Google confirmed it wasn’t. Nonetheless, Penguin is something that has been at the forefront of many brands and businesses minds. It’s been two long years since the Penguin algorithm update had a refresh, and many of the sites that were penalized have been looking to a refresh as a Hail Mary that will turn traffic (and revenue) around. First launched in April 2012, Penguin targeted sites manipulating search results via purchased links or link farms. In response, penalized sites pruned their links and submitted disavow files to Google to disassociate themselves from unnatural links. Bruce Clay has a word of warning, though — submitting a disavow file and pruning links might not have been enough. Beyond cleaning up your link profile, Bruce explains that it’s essential to continue attracting fresh, high-quality links with relevant and valuable content. SEO is a marathon, not a race, and the work never ends. If you’re thinking that a Penguin refresh is going to solve all your traffic problems, you might be in for a surprise. Bruce will talk about Penguin and more at the SEO Training Workshop at Search Marketing Expo (SMX) East on Sept. 26. The one-day course takes a deep dive into SEO methodology. It’s not bogged down with tools, but packed with strategy that Bruce has amassed after more than 20 years in this business. Learn what you need to do and why it matters. If you’re a seasoned SEO, it’s going to make you think differently about your job and how to achieve results. 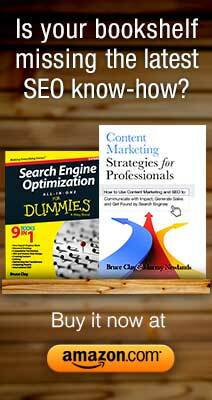 If you’re a marketing manager or executive responsible for digital marketing, it’s going to teach you what you need to know in order to plan and implement an SEO program. There are still a few seats left! Use promo code SMXEBRUCECLAY to save ten percent on registration for the workshop or conference. Google has acquired Apigee, an application program interface (API) management platform. The integration will make it easier for Google Cloud customers to front their products with APIs. Pinterest has acquired Instapaper, the app started by Tumblr founder Arnent and subsequently sold to Betaworks in 2013 that bookmarks articles for later reading. Picking up Instapaper’s technology as well as most of its personnel boosts Pinterest’s ability to expand more into article and news content. For now, Instapaper will continue to function as a standalone app. The search-industry conference series ClickZ Events and Search Engine Strategies have officially closed down. Joanna Lord has been hired as CMO for ClassPass, a monthly subscription providing access to boutique gyms and fitness centers. Lord was most recently VP of marketing for Porch. Swivel, a boutique digital marketing conference, is set for October 10 and 11 in Bend, Oregon. Previously Bend WebCAM, Swivel is a more intimate environment in which SEOs and digital marketers can learn the latest industry tactics from notable speakers such as aimClear’s Marty Weintraub. Register here or get a discount code when you sign up for conference email updates. Pubcon Las Vegas 2016 is happening on October 10–13 in Las Vegas, Nevada. Bruce Clay and Back Azimuth Consulting’s Bill Hunt will present SEO 2016: New Realities – New Beginnings on October 12 at 2:45 p.m. Also at Pubcon, Bruce Clay, Inc. VP Duane Forrester and Stone Temple Consulting’s Eric Enge will present SEO 2016 and the View Forward on October 13 at 1:35 p.m. For a chance to talk to our team in person, please visit us at Booth 215. Register for Pubcon before October 9 to avoid onsite prices. There's a lot of SEO value when an article or website mentions your brand — even if they don't link to you. Find out how linkless mentions (or linkless attribution) makes a difference in your digital marketing efforts! Bruce Clay, Duane Forrester, Kristi Kellogg and Virginia Nussey talk about how mentions in reviews, forums, comments, video transcripts and more can boost your SEO — all without a link! Next time you get started on an SEO project, you're going to want to include the comprehensive SEO Checklist. The SEO Checklist, which is constantly updated to reflect current SEO best practices, is a digital marketer's best friend. It's also been one of Bruce Clay, Inc.'s most popular pieces of content. The SEO Checklist just went through another update to reflect AMP, mobile performance tools, user intent, E-A-T signals and more. The hosts of SEM Synergy talk about what's new and how you can leverage the checklist in your next SEO project. Bing Ads launched its first bid strategy type, Enhanced CPC, aimed at automatically optimizing bids for conversions. A machine learning algorithm adjusts bids in real-time within a range depending on the likelihood of a user to convert. The SEO community noticed what seemed like two Google algorithm updates on Sept. 2. One seemed to affect the core ranking algorithm (responsible for determining quality, relevance, etc. ); the other caused local SERP rankings to noticeably shift, with many spammy local results dropping out of the results. Google has not confirmed either update. In a Google Webmasters Hangout, John Mueller confirmed than the changes were not related to the Penguin update that we have all been anticipating for nearly two years. Rather, Mueller suggested that since Google is always improving its algorithms, several smaller updates might have occurred that were not significant enough to announce. Later in the same hangout, John Mueller said that when Penguin does get updated, Google will announce it, though not necessarily in advance. Google announced that mobile pages "where content is not easily accessible to a user on the transition from the mobile search results" will suffer a ranking hit starting Jan. 17, 2017. Google already demotes app-install interstitials; the latest news will expand that punishment to mobile sites using other types of intrusive pop-ups or interstitials. Google is telling advertisers the minimum number of reviews is increasing to have Seller Ratings extensions display in AdWords ads. Businesses must have at least 150 reviews in the past 12 months, up from the previous minimum of 30, to have their rating stars automatically displayed. The promised preview tool for AdWords expanded text ads is now live across the globe. Advertisers can test how their new ad text looks and make sure it isn’t truncated in the results. Expanded text ads allow for two headlines, up to 30 characters each, and a description of up to 80 characters. Advertisers should use the new tool to help prepare for the end of standard-length text ads; Google’s cutoff for accepting standard ads has just been extended to Jan. 31, 2017. Google introduced a new look for the Google Merchant Center. The redesigned interface looks more like other Google products and is live globally. According to the AdWords blog announcement, the updated Merchant Center has "the same functionality you’re used to, with more streamlined navigation and easier access to additional Shopping programs." An EU commission has ruled that Apple owes as much as 14.5 billion euros in additional back taxes to Ireland, where the company’s European sales are based for tax purposes. Neither Ireland, Apple or the U.S. favors the ruling, and Apple has appealed the decision. Matt Cutts gave a rare interview discussing some of his challenges and frustrations while working at Google. The amiable former head of webspam for Google remains officially on leave, and he is currently working with the Defense Digital Service at the Pentagon. The Court of Justice of the EU has ruled that a for-profit publisher cannot hyperlink to a site that displays content it doesn’t have the legal copyright to show. With a few exceptions, "every act of communication of a [copyrighted] work to the public has to be authorised by the copyright holder" in the EU. The controversial decision burdens the publisher with investigating the legality of an external site, crimps the free flow of information on the internet, and obviously impacts search engines operating in Europe. Snapchat is eliminating the collaborative local Stories feature that curated what people in and near big cities were doing. Twitter will change the way characters count in tweets beginning Sept. 19. As first announced in May, Twitter will exclude from the 140-character limit: images, GIFs, polls, videos, quoted tweets, and a user’s @ name used at the beginning of a tweet. Not counting these types of content in the maximum character count will effectively expand the potential size of each tweet. LinkedIn announced conversion tracking for LinkedIn ads, a capability already offered to advertisers on other social networks. LinkedIn’s tracking data offers extra value for B2Bs, however, by including audience segment information along with the counts, based on its own extensive data on people’s job titles and categories. Facebook now allows advertisers to expand their business across borders. They can now use the Lookalike Audiences tool to find new people in other countries who are similar to their current customers. Facebook Messenger bots can accept payments natively instead of sending users to an external site. This enhancement is part of the Messenger platform 1.2 update that launched this week. At the Apple Event, the company announced the new iPhone 7 and 7 Plus models, which feature enhanced HD wide color displays, stereo speakers, and dual cameras (shipping starting Sept. 16). New AirPods that provide wireless audio from multiple devices will be available in October, and Watch Series 2 was also announced. These new hardware technologies will support increasing emphasis on rich visual and audio experiences for content marketing consumers as well as the future of voice search.